Squash centres in all corners of the globe hosted a wide variety of events to highlight the sport’s appeal to mark the 16th edition of World Squash Day on Saturday. The breathtaking skills of the sport’s leading players took centre stage on finals day at the FS Investments US Open in Philadelphia – where Egypt’s world champions Mohamed Elshorbagy and Raneem El Welily took the PSA World Tour Platinum titles, Elshorbagy claiming the honours for a third time. 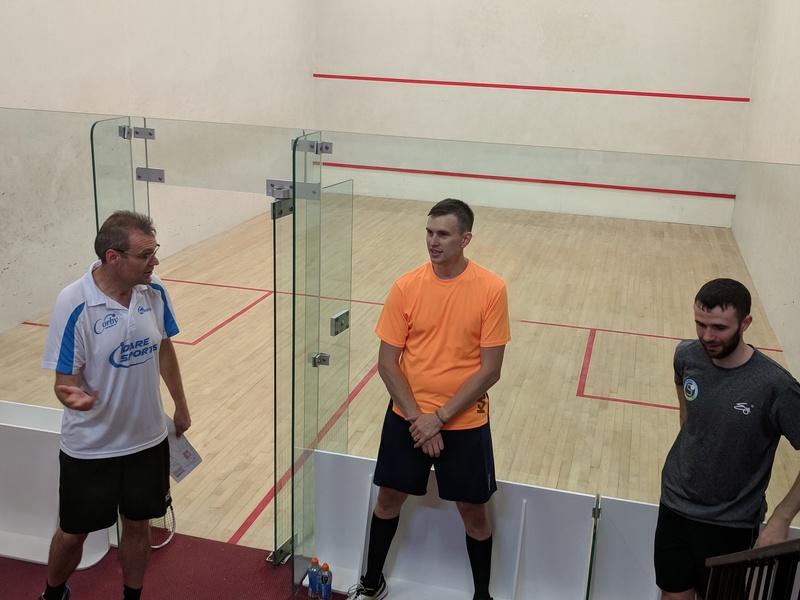 Also feeling blessed were players in the English county of Northamptonshire, as newly-ordained curate Phil Nightingale, a PSA member who is based at the picturesque village church in the market town of Higham Ferrers, take to the court at Brackley Squash Club. The former world No.141 joined in a fun challenge event to promote plans to build a new squash club in Corby. “It’s the biggest town in England without a squash club,” said organiser James Roberts (pictured below, left, with Nightingale). Roberts also co-ordinated a special World Squash Day auction, with lots generously donated by England stars Nick Matthew, Daryl Selby, Laura Massaro and Sarah-Jane Perry. Proceeds went to the Aberystwyth Chemotherapy Unit in Wales, which has extended the life of squash coach John Batty for more than seven years since he was diagnosed with cancer. Many other PSA members took part in exhibition matches in various parts of the world and Nick Mulvey literally went the extra mile (or 90) by joining a joined a group of 20 squash players who took part in a gruelling charity bike ride. They set off at 6am from the Lexden club in Colchester, visiting four clubs in Suffolk, playing a game at each, before returning to a final match at Lexden. Their marathon took 12 hours and raised more than £4,000 for a charity helping premature babies and sick children. Teenage squash ambassadors from all over the world impressed spectators at the Youth Olympics in Buenos Aires, Argentina, where Squash was enjoying its status as a Showcase Sport in its first involvement with Olympic movement. Watched over the six days by thousands of enthusiasts (see above), including guests from the IOC, the youngsters competed in a demonstration event on a spectacular all-glass showcourt with a high-tech front wall developed by German company interactiveSQUASH in partnership with the World Squash Federation and the Professional Squash Association. Continuing the Olympic theme, young players recorded a video at the foot of the Eiffel Tower in support of squash’s bid for a place in the Paris 2024 Games. In Iran, a special World Squash Day event to provide fun squash games for children suffering from Downs Syndrome was partnered with a campaign to protect the Iranian Cheetah, a species facing extinction. 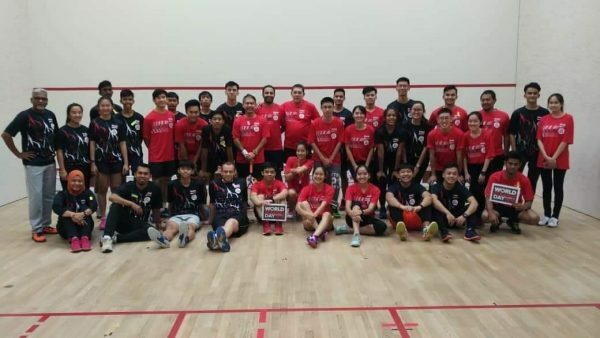 At the Nicol David Squash Centre in the Malaysian capital Kuala Lumpur, national juniors from the Bukit Jalil Sports Schools and the national coaches came together for a friendly match (see below), where the total points from all players win. The red team, led by national coach Ajaz Azmat overcame the blue team led by national junior coach Andrew Cross. There were several events in the country, but the one with the biggest fanfare had to be the one held in Seri Menanti, the royal town of the Negeri Sembilan state, where squash was born in Malaysia. 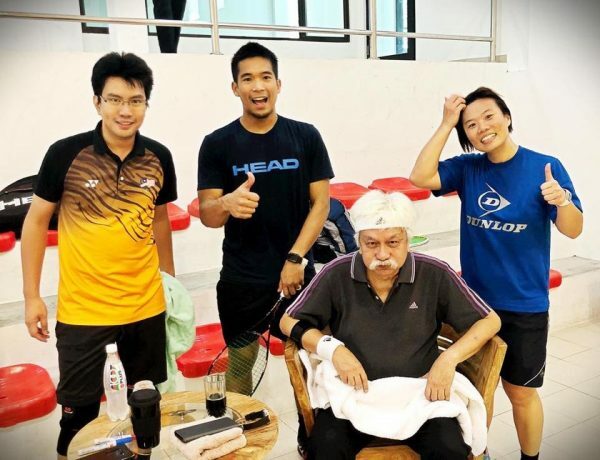 Top Malaysian player Nafiizwan Adnan and former pro Sharon Wee were hosted by the ruler of the state Tunku Muhriz ibni Tunku Munawir and crown price Tunku Zain Al-Abidin, and played a couple of games of doubles. 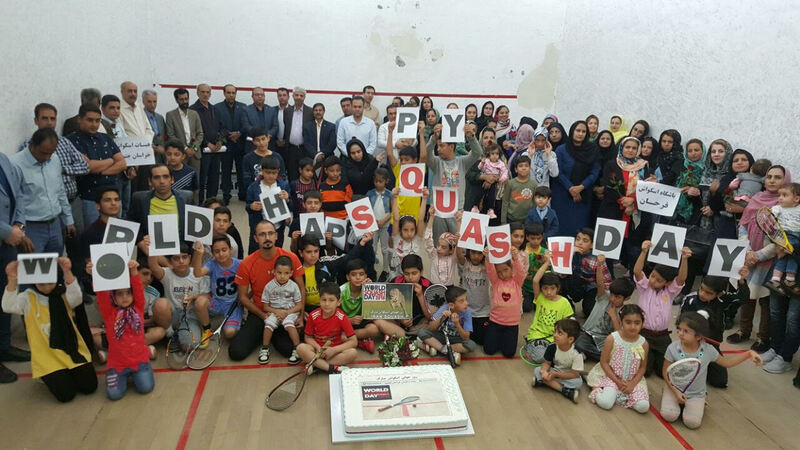 World Squash Day events included several creative themes, featuring fancy dress and wooden-racket competitions, and others reached out into their communities to set up programmes for underprivileged children. This was repeated on different continents, with several taking place in South Africa, others in India and the UK, and also at the Scenic City Squash Club in Chattanooga, USA. World Squash Day 2018 was also marked by the release of an Official Single Africa, a song written by squash-loving composer Stuart Sharp and sung by the late American star Oliver Cheatham during a charity concert in Zambia in 1990. Proceeds from the royalties will be going to deserving causes in squash. Exhausted World Squash Day founder Alan Thatcher, publisher of Squash Mad, stayed awake for more than 48 hours to co-ordinate events across the globe. He said: “I wanted to support two 24-hour marathon events in England, taking place at Warrington and the Warwick Boat Club, plus another in Cape Town, and kept in touch with hundreds of other events via social media. “Fittingly, the day finished with fireworks at midnight after a squash festival in Poland, and that was followed by two brilliant finals of the US Open in Philadelphia.